A band of patients known as the Lucky 13 lift spirits in the hospital but one holds a secret which could threaten their safety. The return of a patient spells trouble for Margaret. The staff gather at a funeral for some of the patients, and Joan is in agony not knowing whether her fiance is alive or dead. It would be so dangerous if anyone knew her connection to the enemy, but Rosalie has previously seen the ring and now she watches Joan intently. Is the truth about to come to light? Joan's spirits are lifted by the arrival of thirteen Tommies from her home town of Liverpool - known as the Lucky 13. Joan has a fondness for these men, whose united spirit has given them a belief that if they all stick together, none of them will die. But when she discovers that one is much sicker than thought, she finds herself the victim of blackmail. Elsewhere, Thomas seizes his opportunity to pursue Kitty, but when she gets a shocking summons to meet with a mysterious figure from home it is Miles who comes to her aid. Will Kitty face up to her past, and where will that leave her budding romance with Thomas? And the return of an old patient causes ripples between Roland, Grace and Margaret. Loyalties are called into question, but who will come out on top? Sarah Phelps discusses the inspiration for The Crimson Field. 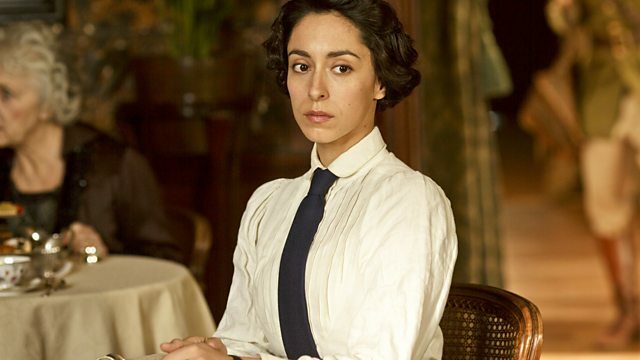 Oona Chaplin discusses Kitty Trevelyan’s role in the hospital. Kevin describes the difficulties for Roland of running a hospital. Production Designer Cristina Casali narrates a tour of the set.